Containers: More Uses than You Think! The humble shipping container is no longer used just as a tool for transporting and storing large or bulky items. While this remains to be their primary use and will no doubt continue to do so since they’re robust, air and water tight, and reliable, they’re alternative uses are becoming as long as the trucks used to transport them. Insulated containers are being used at mine sites and other businesses across the country as portable offices, labs and accommodation. Available in different sizes including 10ft, 20ft and 40ft, Coastal Containers’ shipping containers can be modified to suit your working environment and tools or materials. 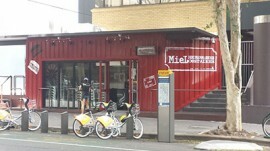 Newly opened burger café, Miel, is in a modified shipping container. Owner and chef Johnny Na says he chose a container for his speciality burger café as he wanted to do something different. “So many restaurants look similar so I wanted something different and unique. When I was in Korea helping set up my cousin’s business, I saw a container shop and that’s where I got the idea. So last year, when decided to start by own business, I worked with a shop fitter, who helped me with design ideas and modifying it,” Johnny explains. “It’s a really good idea. It’s something different in Australia. You can make it how you like. You can make it industrial or create a decor and paint the exterior to match your food – and it’s more economical and environmentally friendly. I’d love to see them become part of our culture,” Johnny added. Coastal Containers can work with you to modify a shipping container to your specifications. Contact us today on 1300 881 676 for more information or a quote.